The ‘Silk Road’ was a set of interconnected trade routes which connected the mediterranean to China. Extending over some 8,000 km, it was a major contributor towards the development of China, India, Persia and even ancient Rome. 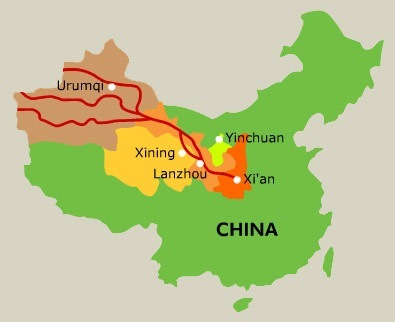 While there were several routes for the silk road, they all ended up at Chang’an, the ancient capital of China (see map below). Although I had worked in China for almost four years I had never managed to visit this place until I found that I was passing through nearby Xi’an on my way west. 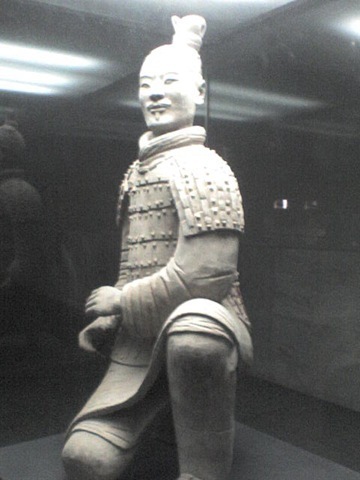 That called for a short visit to see one of China’s greatest treasures: the terracotta army. I was travelling with my colleague Jean-Marie Braun and we had just finished a short mission to Taiyuan. We finished our work early due to another colleague missing his flight in Beijing and so I decided we would head to our next stop, Urumqi in the far west earlier than planned. When my Beijing office told me that we would have to stop in Xi’an I jumped at the chance. My schedule was more flexible than Jean-Marie’s which meant that while he had about 12 h in Xi’an, I would be able to spend the full day. We arrived about 17:00 and dropped our bags off at the Sofitel hotel. As a frenchman J-M was very pleased to be staying there-and it was a very nice hotel as well. Even though the World Bank usually puts us up in 5 star hotels, there can be a surprising variation in the quality of such hotels. The Bank was preparing a new urban transport project in Xi’an and I was one of the reviewers, so I had read (and re-read) about the transport issues in the city. 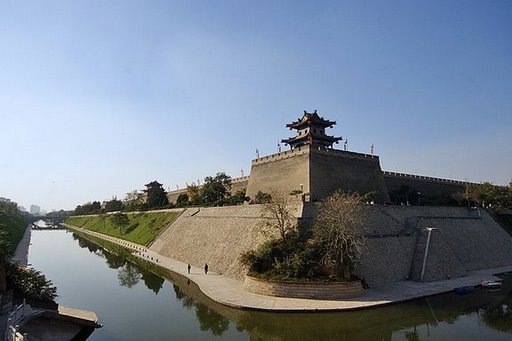 Xi’an is famous for its wall which runs around the entire city. This of course causes transport problems as traffic is constrained to come in by the city gates. It was night when we arrived and I never got a good photo so the one below is from Wikipedia. J-M is a great walker and so we dropped our bags and headed out into a rainy evening. In some respects we were disappointed since the city, except the magnificent wall, was a typical Chinese city: lots of traffic, modern buildings, etc. At least we could confirm that our project was needed! After consultation with the concierge I had decided that we would visit two historical towers in the City, which were also near the city’s muslim quarter. We went over to the ‘Drum Tower’ just in time to catch a demonstration. A group of about 8 musicians played drums and other instruments which was very impressive. I had not appreciated the variety of different designs of drums (well illustrated in the museum they had), thinking only in the context of size. While size does matter, the big drums were especially impressive, the array of sounds they produced was astounding. We then hoofed it over to the ‘Bell Tower’ where we saw a similar demonstration on replica ancient bronze bells. It was also very well done, but I preferred the drums. By this time we were hungry so we walked over to the muslim quarter to get some food. There was a market which we wandered through selling tourist trinkets as well as lots of dried fruit and nuts. As we wandered the streets there were many vendors selling grilled meat as well as naan bread. J-M got very excited at the prospects of this type of food – even moreso when I told him this was common in Xinjaing Province where we were going next. It’s not so exciting for a vegetarian. We chose a small restaurant where J-M had eight lamb skewers and a beer; I had naan bread and peanuts with water. He graciously bought me dinner; all of US$ 3.50 for both of us. We wandered the streets in the muslim quarter – and there is a very large muslim community in Xi’an – before hopping a motorcyle trishaw taxi over towards the wall. It amazes me how universal the driving habits of taxi drivers are. It takes a lot to scare me but he succeeded. Wrong way on busy roads, up on the sidewalk almost hitting pedestrians and vendors, etc. As soon as he stopped – even though it wasn’t our destination – we jumped out. He was not happy with what I paid him. We were heading for the city wall but it was too late to go up on top. It was still impressively lit and we walked along the base of it between the wall and the northern moat. The rain had subsided so it was a very pleasant walk. I managed to get us back to the hotel and we parted; J-M to travel early the next day to Urumqi and myself to go on a tour which the concierge had arranged for me. I had been advised to stay at this hotel since it was not overly popular with tourists. Unfortunately that was not the case this weekend and it was a zoo at breakfast, with tables set out even into the corridor outside the restaurant. Fortunately I was able to grab something before the guide collected me. 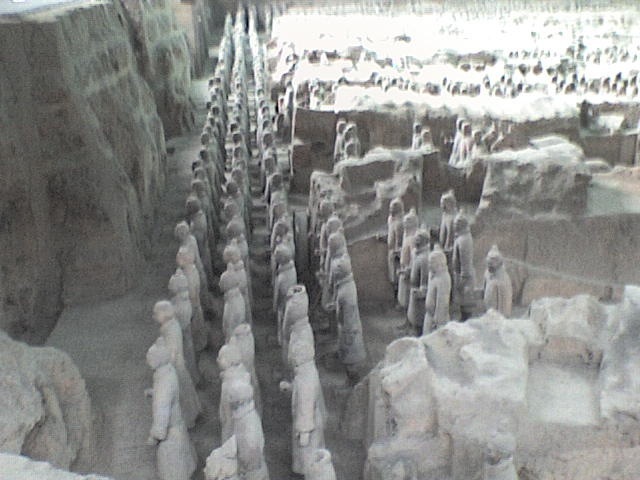 We then went on a 60 minute tour around Xi’an as we gathered the other travellers before heading out to the terra-cotta warriers. 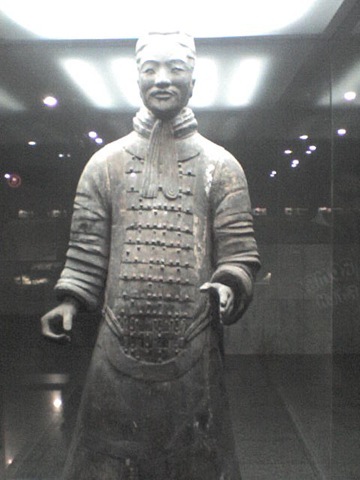 The first Qin emperor (Qin Shi Huangdi) ruled from 247 BC – 210 BC. 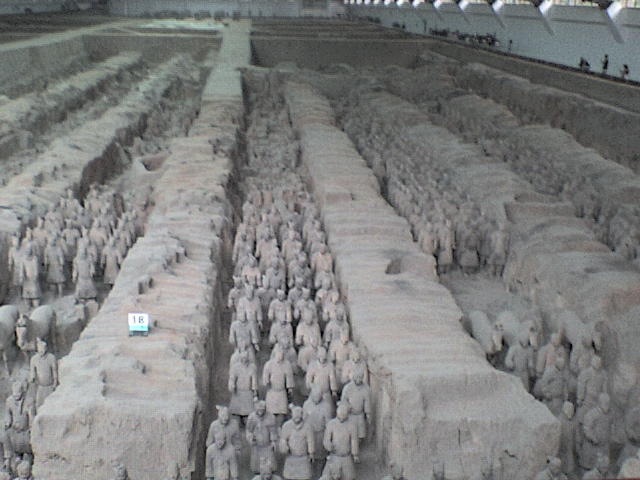 He decided that he wanted an army to help him rule in the afterlife so the terracotta army was created. These are life-sized figures made from terracotta. The level of detail is incredible, as shown in the photos below. There was an excellent film showing the history of the army, from its creation through disovery in 1974 by a farmer digging a well. It is believed that it took 38 years for some 700,000 workers to create the army. Each figure is unique with specific parts manufactured and assembled after being fired as opposed to crafting one solid piece of terracotta and subsequently firing it. 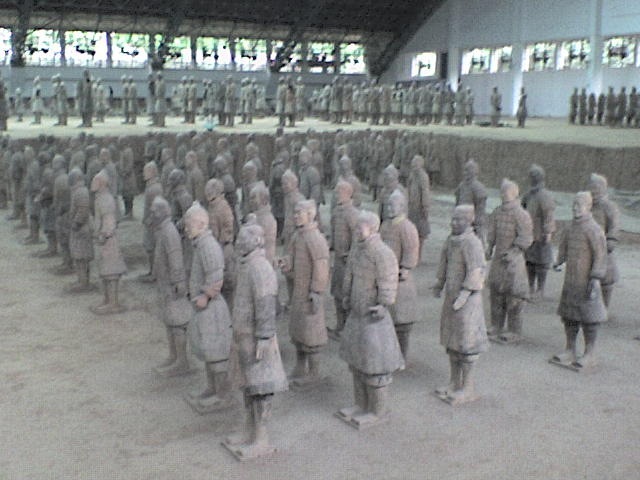 After completion, the terracotta figures were placed in the pits outlined above in precise military formation according to rank and duty. They vary in height, uniform and hairstyle in accordance with rank. They were provided with real weapons (subsquently stolen) and painted, although the paint oxidized when it came into contact with the air so the army is now just a grey colour – apparently affected by the pollution in the area. 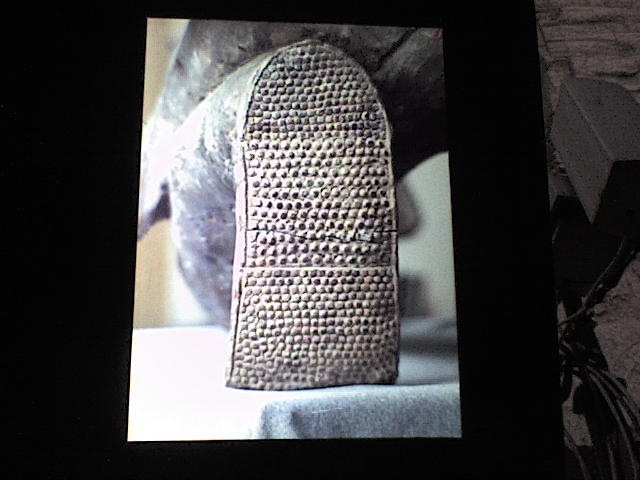 To date they have excavated three areas with the army, but more may follow. The actual tomb of the emperor has not been excavated – they say that they aren’t quite sure where it is, although they have a good idea. Each of the three areas is housed in a large structure, and it is possible to see the army in various stages. This is the first – and largest – display area. You can see how the army is lined up, ready for battle. I must say that it was very eerie. I half expected them to come alive and start marching. One fascinating element to the story is what happened after the emperor’s death. 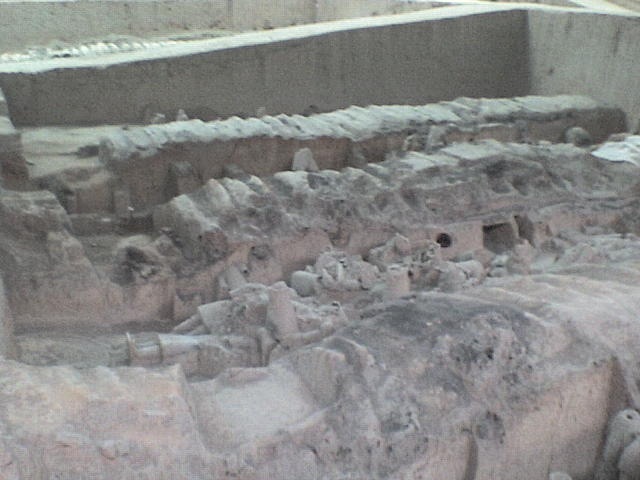 There was a peasant uprising led by General Xiang Yu which looted the tomb and structures holding the Terracotta Army, as well as setting fire to the necropolis and starting a blaze that lasted for three months. As a result, when excavated many of the figures were broken and lying in disarray. Just think, spending 38 years building the army to have it destroyed after five. The photo below gives you some idea of what they usually look like when found. Our guide explained that the reassembly of each warrior can be described as a huge jigsaw puzzle. There were several in various stages of assembly and I could see what she meant. They would be 98% finished, but a chunk of chest or head was missing. I don’t have the patience for it. 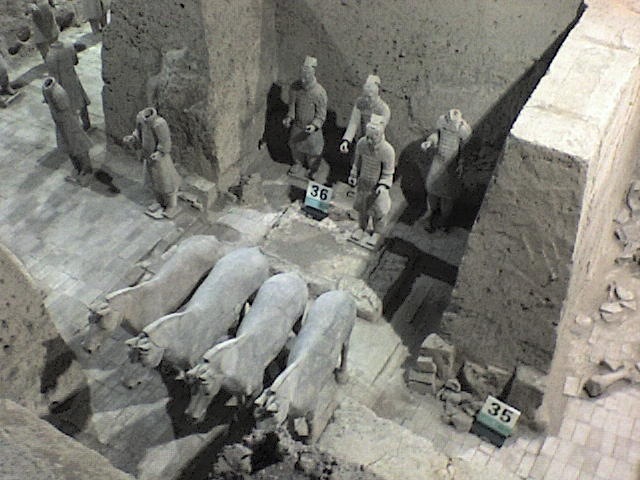 Besides the terracotta army we made several other stops including a factory making replicas, a silk factory, the ‘Goose Temple’, the site of an ancient village. But all these paled in comparison to the army. I was grateful to have been able to see such an amazing creation. Well worth the effort to visit. This entry was posted on Thursday, September 6th, 2007 at 11:26 am and is filed under Uncategorized. You can follow any responses to this entry through the RSS 2.0 feed. You can leave a response, or trackback from your own site.